The term smart drugs is used to refer to compounds that can improve different aspects of cognition. These include things like intelligence, focus, alertness, memory, motivation, and many others. There are a variety of different compounds used for this purpose and many of them can be found in common foods and meals. Even though these smart drugs are relatively new and growing in popularity, many of the compounds have been used for thousands of years in traditional Chinese medicine and Ayurvedic treatments. The following guide on smart drugs is not comprehensive, but it can offer a few suggestions for beginners who are not sure about taking these compounds for improved cognitive abilities. Some are afraid of the risks associated with changing brain biochemistry, which is a valid concern. Knowing as much about nootropics (smart drugs) as you can will help prevent a lot of problems. Throughout history, people have been using methods to develop their intelligence and cognitive abilities. From the hunter-gatherer days until today, finding a mental advantage over opponents can lead to a great evolutionary advantage. Until recently, smart drugs have been the domain of natural compounds and concoctions that were used by people that knew the land well. In many parts of South America, native tribes used different herbs, roots and plants in order to perform rituals, rites of passage, and just improve brain chemistry altogether. This includes chewing the coca leaf (when processed, it becomes cocaine). In traditional Chinese medicine, there are a wide variety of different remedies used for improving cognition, reducing anxiety, and generally helping cognitive abilities. Ayurvedic treatments from the Indian subcontinent have also produced similar results and modern studies have verified the claims of these compounds. While they had no scientific laboratories hundreds and thousands of years ago, experiences told them everything they needed to know. More modern times have seen plenty of smart drugs as well. In some cases, even alcohol can be considered a smart drug if taken in moderation to reduce anxiety and perform better under conditions with less stress. However, like most things that humans consume, alcohol is often taken too far and becomes a “dumb drug” instead. Nonetheless, all the way until the present, humans have found natural compounds and concoctions that could improve focus and attention. Coffee was first brewed by Middle Easterners many centuries ago and still remains one of the most popular smart drugs for improving focus and alertness today. If you are planing to start with a regimen of smart drugs, there are a few things that you want to be careful and mindful of. For one thing, keep in mind that you do not have to start with the most potent smart drugs that you can find. There are plenty of cognitive enhancers that will be great to start off with and will not lead to problems due to sensitivity. One of the biggest questions within the smart drug community is whether or not to use natural or synthetic cognitive enhancers. The drugs that are from natural compounds are not always the safest just because they come from the Earth naturally. Consider that cyanide and many other plants are poisonous, which does not necessarily make them healthy. It is true that humans know less about science than we think and would like to believe, but natural ingredients are not healthier or better just because of their origin. The following breakdown will offer a few natural smart drugs that you might already utilize and then some other synthetic products that are probably new for you. These are all great beginner drugs with some more advanced options located below. The best way of finding out what works for you is to try each out with recommended dosages and note the results with self-tracking. Of course, caffeine is one of the primary nootropic drugs that is useful for improving your focus and attention. A dosage of 100 mg should be enough to provide the results you are looking for, but cycling off of the compound is in your best interest. People build a tolerance to caffeine naturally, which can make you need more and more just to feel an effect. Try to avoid caffeine for a few weeks and do not take quantities more than 100 – 250 mg as it could cause some potential health risks. It is possible to burnout your adrenal glands with this type of usage. Another great method for improving cognition is L-theanine, which is the natural compound found in green tea. It is a perfect way to get started with smart drugs because it is very calming and relaxing. It is a natural method of reducing your anxiety and it actually works perfectly with caffeine. The combination of 100 mg caffeine and 200 mg L-theanine (or a 1:2 ratio) is well-known as a beginner supplement. The scientific literature seems to match the traditional Chinese medicinal practices. Asian ginseng is a great anti-anxiety and relaxation compound, which is naturally occurring. It is actually one of the best researched compounds that shows improved performance through reduced anxiety. This natural compound is of Indian origin and improves anxiety while improving your cognitive abilities. You can find the extract from the root, which is relatively safe and has few side effects. There are a few synthetic smart drugs that can improve your cognitive functioning as well and have been tested extensively. The amphetamines like Ritalin and Adderall are well known for improving focus and attention, but they are problematic in the sense that they can be harmful to health. The following list of beginner synthetic smart drugs will provide many of the advantages you look for with nootropics without the negative side effects. This is the grand-daddy of smart drugs. It is the oldest one and was discovered in the 1970s, which offered ample time for research and evidence to validate usage. Using piracetam can help to improve memory in young and elderly individuals who are suffering from Alzheimer’s disease and senile dementia. It is also useful for people that have neurological disorders and need some type of protection. Trauma and other neurological degeneration can be reversed through the use of this GABA derivative. Most importantly, the drug is not so potent as to cause significant adverse effects. Piracetam is typically well-handled and studies on animals show that 400 times the recommended dosage can provide no irreversible effects. These two synthetics are within the same line of piracetam, but they are far more potent due to the high rate of absorption. This can help you to improve your memory and protect neurological connections, but also have a sense of stimulation as well. A lot of people who have built up a tolerance to caffeine find that aniracetam and oxiracetam are far better at providing this type of advantage. More importantly, they work through different channels in the brain to improve stimulation without too many negative side effects. As with piracetam and any other racetam, it is best to combine the aniracetam / oxiracetam with choline. 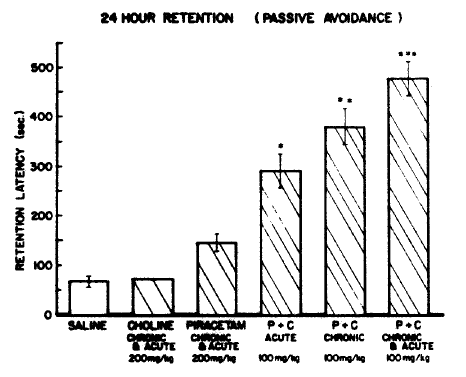 The tests and literature show that these racetams increase utilization and uptake of acetylcholine, which requires choline precursor material in most people without adequate dietary intake. People who are into smart drugs often mentioned Modafinil as being a great synthetic product for improving focus, motivation and concentration. Different from the amphetamine class of stimulants, Modafinil is well known and recommended by numerous people including Tim Ferriss and Dave Asprey. Both of these individuals have discussed usage on the Joe Rogan podcast and various other sources all validate their claims. The only problem with Modafinil is that it is a prescription strength drug in the USA and should be taken once a prescription is given. Discuss taking Modafinil with your doctor before you ingest it for improved focus and motivation. It may not be needed and taking CILTeP could be a great alternative.